Passiflora plants are subtropical vines that die back to the ground in freezing weather, but stay evergreen in areas with mild winters. These vines cling to nearly any support and need to be planted in areas that offer protection from the wind. The vines grow 15 to 20 feet (4.5 to 6 m) each year, so they need pruning to control their size. Passiflora vines are commonly grown from seeds sown in late winter or early spring. Fresh seeds germinate in 2 to 3 weeks, while dried seeds take up to 4 weeks to sprout. Some seeds take up to 48 weeks to sprout. 1. Rub the Passiflora seeds with a piece of fine grit sandpaper. This helps the sprouts break through the hard outer shell. Soak the seeds in warm water for 12 hours. Change the water whenever it cools off. 2. Fill a plant pot with seed starter potting soil. Leave 1 inch (2.5 cm) of space between the soil and the rim. Use a 6- to 8-inch (15 to 20 cm) diameter pot when germinating several seeds and a 4-inch (10 cm) pot for 1 or 2 seeds. Place the pot in room temperature water until the top of the soil is damp. 3. Poke a 0.25-inch (6 mm) deep hole into the soil with your finger and drop a seed into each hole. Lightly cover the seeds with soil. Place the pot in direct sunlight, and keep the soil moist. Do not let the soil dry out, because this will stop the germination process. 4. Keep the area warm while the Passiflora seeds are germinating. The seeds need heat to sprout. Ideally the temperature during the night should be 68 degrees Fahrenheit (20 degrees Celsius), and the daytime temperature should be 86 degrees Fahrenheit (30 degrees Celsius). Keeping the temperature a constant 79 degrees Fahrenheit (26 degrees Celsius) works well too. Gently dig up the seedlings when they are large enough to handle easily. 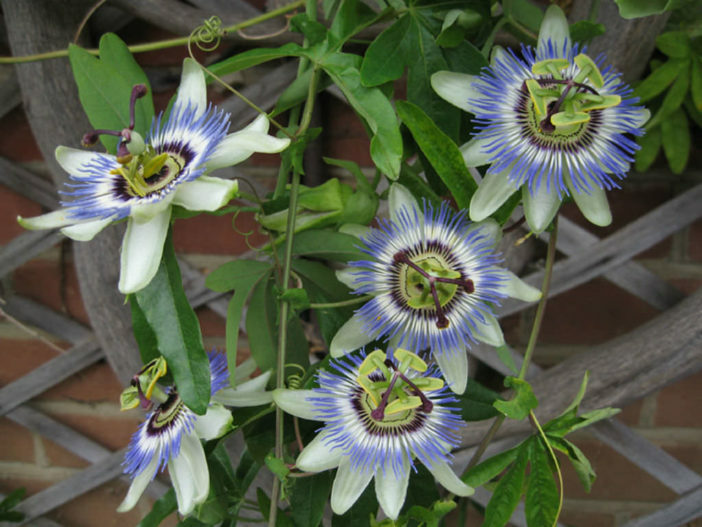 Plant them in individual containers since Passiflora vines do not like to be crowded. Transplant the young vines when they are 10 inches (25 cm) high to their permanent home. If they are 3 feet (90 cm) tall before transplanting, prune them back to about a foot (30 cm) high and water them heavily before moving.